Princess Margaret was a sensation in her youth – beautiful, fashionable, and with a social life (and love life) made for tabloid consumption. 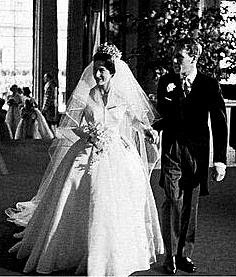 When she finally married, to photographer Antony Armstrong-Jones on May 6, 1960, the world was watching (quite literally: hers was the first televised royal wedding). The fashion plate princess did not disappoint: her wedding gown is still wowing people decades later, enough so to earn itself the #6 spot on your countdown. 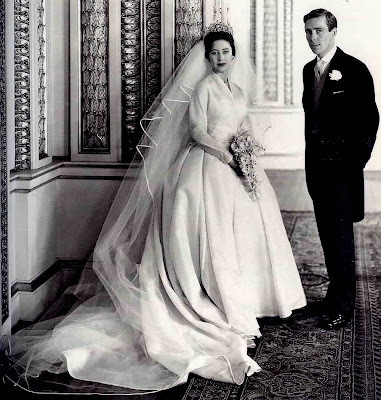 Margaret turned to Norman Hartnell, the couturier responsible for much of the daily style of Margaret’s sister, the Queen, and her mother, the Queen Mother, as well as several landmark fashion moments for the women: the White Wardrobe, the Queen’s wedding gown, the Queen’s coronation gown. But the bride did not want another heavily embellished traditional Hartnell creation; she and the groom requested a simple line. 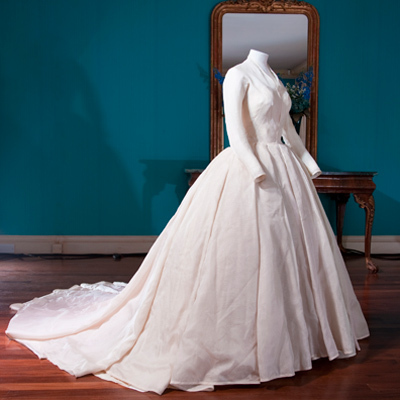 Margaret was a petite lady, and every aspect was designed to elongate and flatter her. 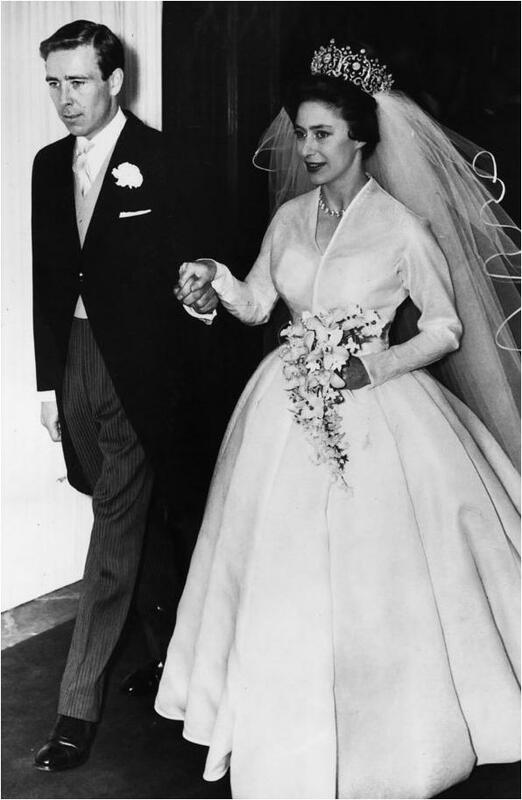 Hartnell came up with a white silk organza gown that was simple and not at the same time. The bodice featured long sleeves and a v-neck, using 30 yards of sheer silk. The slim fit top ballooned into a large skirt, which accentuated the bride’s tiny waist. The skirt, in 12 panels, used another 40 yards of fabric plus an 8 layer stiff tulle petticoat underneath to create its shape. It extended into a train behind. Hartnell’s typical practical details were present in a deep pleat at the back of the skirt that allowed the bride to sit without creasing her dress. The St. Cyr of Paris veil was tulle bound plainly in ivory satin, adding another simple but voluminous white layer to her ensemble. 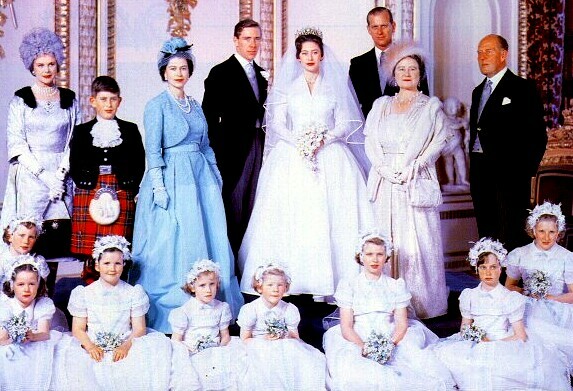 The overall effect prompted The Times to write of Margaret, “it was as though she moved in a soft white cloud.” Hartnell also designed the young bridesmaids’ dresses, at the bride’s request modeled after an early dress of hers that her late father had particularly liked. 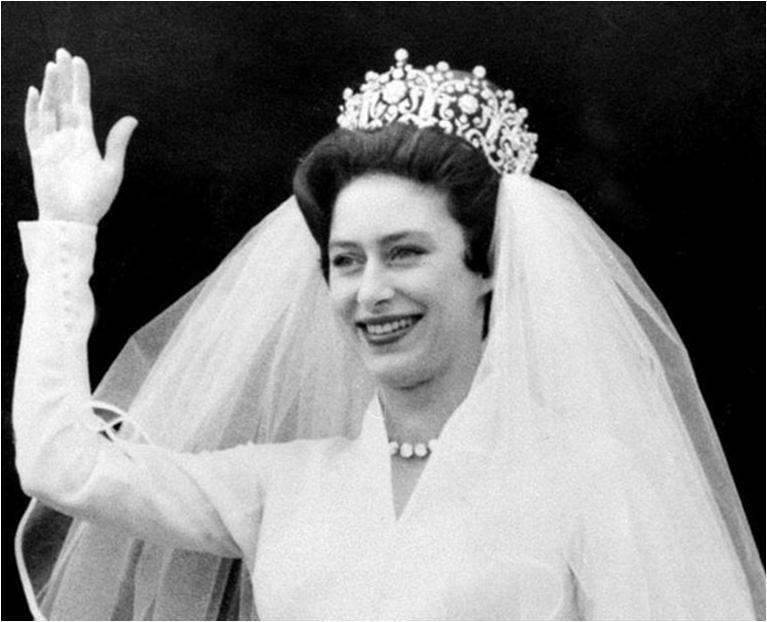 The dress’ simplicity allowed for some statement accessories: a diamond necklace from her grandmother Queen Mary and the large Poltimore Tiara, acquired specially for Margaret. The necklace seems to have been the one given to Queen Mary by Lady Mount Stephen and subsequently gifted to Margaret; this, along with the Poltimore Tiara, was sold at auction after Margaret’s death. The magnificent Poltimore earned a place on your list of favorite tiaras.